Another example was the young tattooed man we met while touring a moray. A moray is an ancient Polynesian meeting place and usually has stone work and tikis. The young man explained that the spiritual part of the moray was back in the hills. 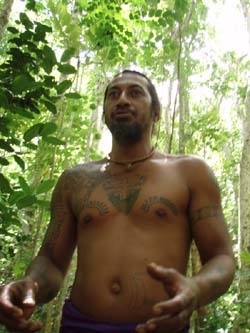 He led us up a jungle path into the mountains where the real heart and spirit of the moray resided. As a culture that has been dominated by external forces for a few hundred years, the Polynesians seem to see it as their destiny to be good hosts to their many visitors and share the beauty of their fantastic Islands. A cynic might say that is the tourist office line – but why be cynical. Polynesians have great working hours. Everybody starts early, 6 or 7AM. Work until 11:00 or so then a long lunch. If there is nothing to urgent to deal with at lunch, they return to work around 2:00 PM for an hour or two before knocking off for the day. This seems to be the general case but banks, post offices and groceries often keep more regular hours particularly in the city of Papette. Outside of Papette, the working dress is very casual. We were surprised to see bank employees working without shoes. Shirts for the guys seem pretty much optional unless working with the public or tourists. Bright flowered shirts for the guys or a bright dress for the gals prevails. Both sexes like to wear at least one flower. Behind the right ear, means you are available. Behind the left ear – your heart is taken. Hats and hair are often adorned with more flowers. We were surprised by the number of transvestites. More on transvestites here.